Dr. Ling is an Associate Professor of Radiation Oncology at the University of Rochester Medical Center. She received a B.A. in Biology from Williams College in 1983. The Following year, she was awarded a Certificat de Merité from the Cordon Bleu Académie Cuisine in Paris, France. She then enrolled at the University of Maryland and received her M.D. in 1988, which was followed by residency at Johns Hopkins Hospital. From 1992 to 1996, Dr. Ling relocated to the Boston area, where she was an instructor and then Assistant Professor in Radiation Oncology at Tufts University School of Medicine and New England Medical Center. She was also a visiting scientist at the Massachusetts Institute of Technology's Nuclear Research Laboratory. From 1997 to 1999, Dr. Ling was a Clinical Assistant Professor at the University of Washington Medical Center in Seattle. In 1999, Dr. Ling moved back east and joined the faculty at the University of Rochester. She is board certified by the American College of Radiology. Dr. Ling's interests and publications have covered topics relating to breast cancer such as the latest radiation treatment modalities (stereotactic body radiotherapy, intensity modulated radiotherapy), breast conserving therapy and reconstruction, and side effects of treatment (bone loss, nausea, radiation dermatitis, fatigue). She has also been an invited speaker at special events hosted by local breast cancer support organizations. 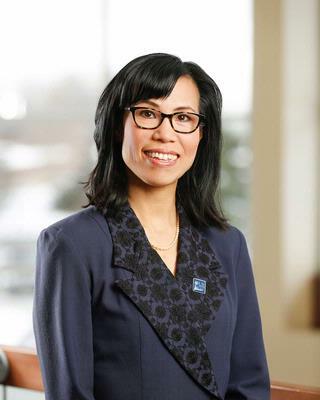 Dr. Ling is a member of the American Society for Therapeutic Radiology and Oncology. She also received board certification from the American Board of Integrative and Holistic Medicine. Peppone LJ, Ling M, Huston AJ, Reid ME, Janelsins MC, Puzas JE, Kamen C, Del Giglio A, Asare M, Peoples AR, Mustian KM. "The effects of high-dose calcitriol and individualized exercise on bone metabolism in breast cancer survivors on hormonal therapy: a phase II feasibility trial." Supportive care in cancer : official journal of the Multinational Association of Supportive Care in Cancer.. 2018 Aug 0; 26(8):2675-2683. Epub 2018 Feb 22. Ryan Wolf J, Heckler CE, Guido JJ, Peoples AR, Gewandter JS, Ling M, Vinciguerra VP, Anderson T, Evans L, Wade J, Pentland AP, Morrow GR. "Oral curcumin for radiation dermatitis: a URCC NCORP study of 686 breast cancer patients." Supportive care in cancer : official journal of the Multinational Association of Supportive Care in Cancer.. 2018 May 0; 26(5):1543-1552. Epub 2017 Dec 01. Turner BM, Skinner KA, Tang P, Jackson MC, Soukiazian N, Shayne M, Huston A, Ling M, Hicks DG. "Use of modified Magee equations and histologic criteria to predict the Oncotype DX recurrence score." Modern pathology : an official journal of the United States and Canadian Academy of Pathology, Inc.. 2015 Jul 0; 28(7):921-31. Epub 2015 May 01. Chapter Title: Preliminary Clinical Experience with the Peacock Intensity Modulation 3-D Conformal Radiation Therapy System.